This case study describes the complete root cause analysis and resolution of an Apache Log4j thread race problem affecting a Weblogic Portal 10.0 production environment. It will also demonstrate the importance of proper Java classloader knowledge when developing and supporting Java EE applications. This article is also another opportunity for you to improve your thread dump analysis skills and understand thread race conditions. Major performance degradation was observed from one of our Weblogic Portal production environments. Alerts were also sent from the Foglight agents indicating a significant surge in Weblogic threads utilization up to the upper default limit of 400. Conclusion #1 : The problem appears to be related to the recent changes. However, the team was initially unable to pinpoint the root cause. This is now what we will discuss for the rest of the article. The initial thread surge problem was reported by Foglight. As you can see below, the threads utilization was significant (up to 400) leading to a high volume of pending client requests and ultimately major performance degradation. As usual, thread problems require proper thread dump analysis in order to pinpoint the source of threads contention. Lack of this critical analysis skill will prevent you to go any further in the root cause analysis. For our case study, a few thread dump snapshots were generated from our Weblogic servers using the simple Solaris OS command kill -3 <Java PID>. Thread Dump data was then extracted from the Weblogic standard output log files. As you can see, it appears that all the threads are waiting to acquire a lock on an Apache Log4j object monitor (org.apache.log4j.spi.RootCategory) when attempting to log debug information to the configured appender and log file. How did we figure that out from this thread stack trace? Let’s dissect this thread stack trace in order for you to better understand this thread race condition e.g. 250 threads attempting to acquire the same object monitor concurrently. At this point the main question is why are we seeing this problem suddenly? An increase of the logging level or load was also ruled out at this point after proper verification. The fact that the rollback of the previous changes did fix the problem did naturally lead us to perform a deeper review of the promoted changes. Before we go to the final root cause section, we will perform a code review of the affected Log4j code e.g. exposed to thread race conditions. * appenders could be found, emit a warning. *            the event to log. As you can see, the Catelogry.callAppenders() is using a synchronized block at the Category level which can lead to a severe thread race condition under heavy concurrent load. In this scenario, the usage of a re-entrant read write lock would have been more appropriate (e.g. such lock strategy allows concurrent “read” but single “write”). You can find reference to this known Apache Log4j limitation below along with some possible solutions. Let’s remember that this problem got exposed only following a recent deployment. 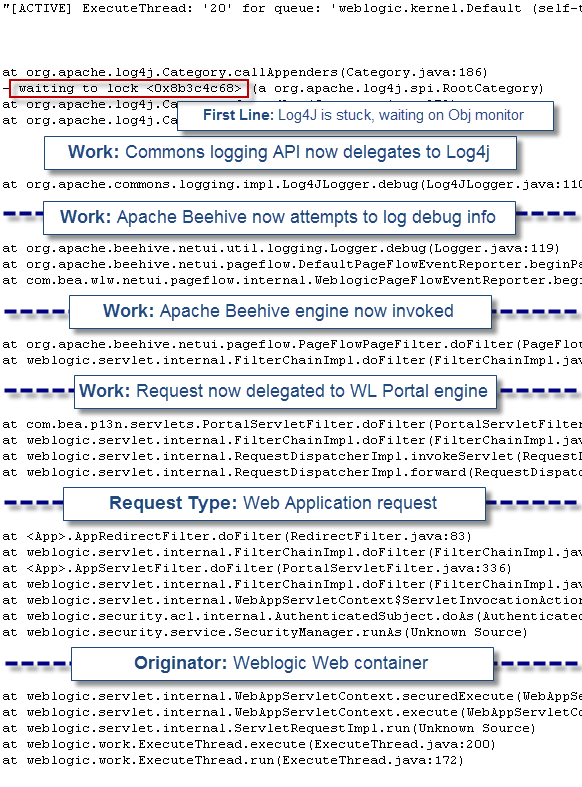 The real question is what application change triggered this problem & side effect from the Apache Log4j logging API? Root cause: a perfect storm! Deep dive analysis of the recent changes deployed did reveal that some Log4j libraries at the child classloader level were removed along with the associated “child first” policy. This refactoring exercise ended-up moving the delegation of both Commons logging and Log4j at the parent classloader level. What is the problem? Before this change, the logging events were split between Weblogic Beehive Log4j calls at the parent classloader and web application logging events at the child class loader. Since each classloader had its own copy of the Log4j objects, the thread race condition problem was split in half and not exposed (masked) under the current load conditions. Following the refactoring, all Log4j calls were moved to the parent classloader (Java EE app); adding significant concurrency level to the Log4j components such as Category. This increase concurrency level along with this known Category.java thread race / deadlock behaviour was a perfect storm for our production environment. This problem case again re-enforce the importance of performing proper testing and impact assessment when applying changes such as library and class loader related changes. Such changes can appear simple at the "surface" but can trigger some deep execution pattern changes, exposing your application(s) to known thread race conditions. A future upgrade to Apache Log4j 2 (or other logging API’s) will also be explored as it is expected to bring some performance enhancements which may address some of these thread race & scalability concerns. Please provide any comment or share your experience on thread race related problems with logging API's.